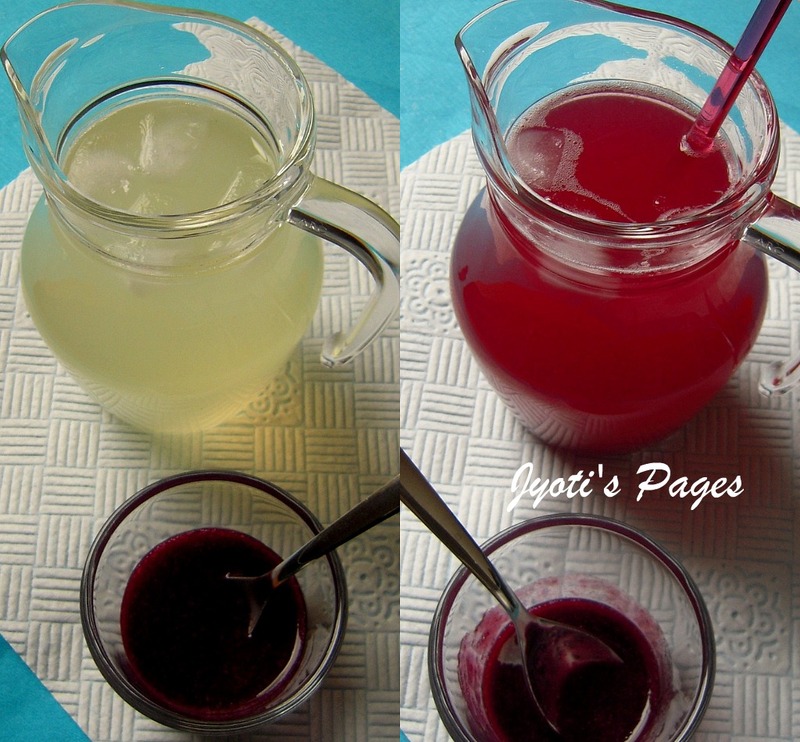 Jyoti's Pages: Lemonade With a Twist ~ Blueberry Lemonade ~ Making It From Scratch! Lemonade With a Twist ~ Blueberry Lemonade ~ Making It From Scratch! Summer for me is the time to indulge in cool delights and cool drinks tops my list. One of the most frequently made drink in my house is Indian Lemonade or Sikanji. Infact, it is one of the few simple things I had learned to make as a child. But, sometimes making the same drink every time you have an urge for a cool drink is monotonous. So, I look forward to trying out new things. Blueberry Lemonade is one such creation. It is simple lemonade with homemade blueberry syrup stirred into it, giving a merrier, berrier, lemony cool drink. Sometimes, when I run out of the homemade bluberry syrup, I mix little blueberry jam with water and strain and use it in instead. I know that sounds weird, but it also tastes good! I am not sure how good it is nutritionally, so I won't encourage you to do the same. But, at times this trick has served my purpose ;-)! The blueberry syrup can be made in advance and can be refrigerated for 1-2 months. We can also substitute blueberries with other berries to get a variety of flavoured lemonade. But, personally blueberry is my favorite. Blueberries are very good for health. ~ They are rich in antioxidants. Antioxidants are understood to help neutralise the harmful free radicals that can cause cancer and other serious dieseases. They also help reduce cholesterol. ~ Blueberries are rich in potassium, which is known to regulate blood pressure. ~ Having a bowl of blueberries will keep your stomach happy and bowels clear. These berries can be easily frozen and can be kept frozen for 5-6 months in zip lock bags. How to freeze bluberries or any other berries? Wash the berries and pat dry. Pick any over ripe or rotten berries from the lot. Make sure the berries are completely dry. Spread them in a single layer on a plate and cover it with a cling film and freeze over night. Take them out next day and fill them in a zip lock bag. Squeeze out any air and lock the bag and freeze again. Use as needed. 1. In a saucepan all the berries, sugar and water and bring it to boil. The berries will start to burst. Turn the heat to medium and add lemon juice. 2. Simmer for 15-20 minutes. Turn off the gas. 3. Let it cool completely. When cooled churn it in a blender and seive the mixture to get rid of any residue. 4. Store in a sterilized jar and keep it in the fridge. Use as needed. Juice of 1 lemon (3-4 tbsp, adjust to taste). 5-6 tbsp sugar (Adjust to taste). A good pinch of black salt. Mix everything together and stir till the sugar dissolves. Keep aside. For blueberry lemonade stir in 4 tbsp of bluberry syrup into it and serve! Enjoy this delicious cool treat this summer! One last peek! Loved the color of the refreshing drink.